Smyrna Beach’s Favorite Steel Drum Band! If you have been dreaming of a beach wedding for your special day than a steel drum band maybe just for you. If you are having a corporate event and are looking for a relaxing and family oriented entertainment than you are looking in the right place. 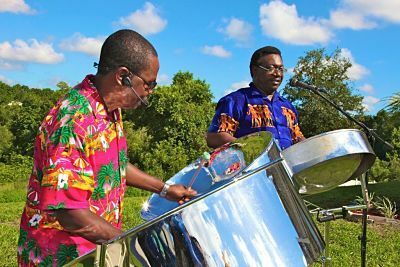 RythmTrail steel drum band has over 20 years of experience with event planning and can offer you a great deal for the best prices in paradise. The RythmTrail steel drum band plays in New Smyrna Beach Florida and all around the state. They also do live performances in the surrounding cities like South Daytona, Daytona Beach, and even Edgewater Florida. If your company is national or international than the RythmTrail can still accommodate you and your guests. They travel anywhere in the world. Do you have your own idea on what songs you want playing at your event? You can do a work up of songs either romantic or even upbeat, and if you don’t have any idea what to play they can still accommodate you. The RythmTrail Steel Drum Band has all the experience you need for your event to be a memorable one. Do you just want a single steel drum player? That’s okay they can provide that. In fact you choose the number and they provide the players, it’s included in the quote. So take the time to call them at (866)495-4522 or get a quote online today. Or you can catch them on FaceBook, Twitter and even Linkedin. See their great videos, lists of songs, and even a photo gallery of past events you shouldn’t miss. The RythmTrail Steel drum Band offers the best in Caribbean Music, and live entertainment you will never forget!